This Asset Management Plan (AMP) is based on the minimum requirements for Asset Management Plans in Queensland as detailed in the Asset Management Advancement Program. Asset Management Advancement Program requires that consistent Asset Hierarchies be established for all data sets by 31 December 2009. In the case of drainage assets BRC has adopted a fairly flat hierarchy with Stormwater Drains being classified as either Trunk or Non-Trunk and the other sub-classes considered to be of equal importance. No future requirements associated with the corporate plan or the operational plan have been identified. There are several factors that may effect the demand for and on drainage assets. Council is gifted drainage infrastructure on a regular basis, with a significant number of new subdivisions coming off maintenance each year. According to the OESR Queensland Regional Database Bundaberg Regional Council's estimated population has increased from 78,943 in 2001 to 95,132 in 2009. Bundaberg Regional Council has yet to finalise a consolidated Planning Scheme for the amalgamated Council. If any changes in land use effecting future demand are included in the new scheme they will be identified here. No changes to government policy or regulations have been identified in this plan. The costs of changes in the future demand on drainage have yet to be calculated. The impact of future demand on service levels, asset lifecycle and financial considerations has yet to be ascertained. The useful life of most stormwater drainage assets will depend on a range of environmental factors. The estimated useful lives given below which have been extracted from the Assetic Asset Management System are best guess averages. The figures below were extracted from the Assetic Asset Management System on 30 September 2009. Condition Inspections - Open drains are inspected every ???? There are eight drainage maintenance activities in BARS. Maintenance Expenditure is detailed in the table below. Council's Stormwater Drainage Renewal/Replacement Plan is based the estimated RULs of individual assets in Council's Asset Register. Because drainage assets are typically long life assets, only assets identified as being in condition 4 are likely to need to be replaced over the next 10 years. Assets in condition 4 have had there RULs set to 8 years, but for the purpose of the renewal expenditure table below the cost has been apportioned equally over the 10 year period. Council's Stormwater Drainage Creation/Acquisition Plan details projected new and upgrade capital expenditure on stormwater drainage assets over a ten year period. Council's Stormwater Drainage Disposal Plan details the proposed timing of asset retirements/disposals and the estimated residual values of assets being retired or disposed of. 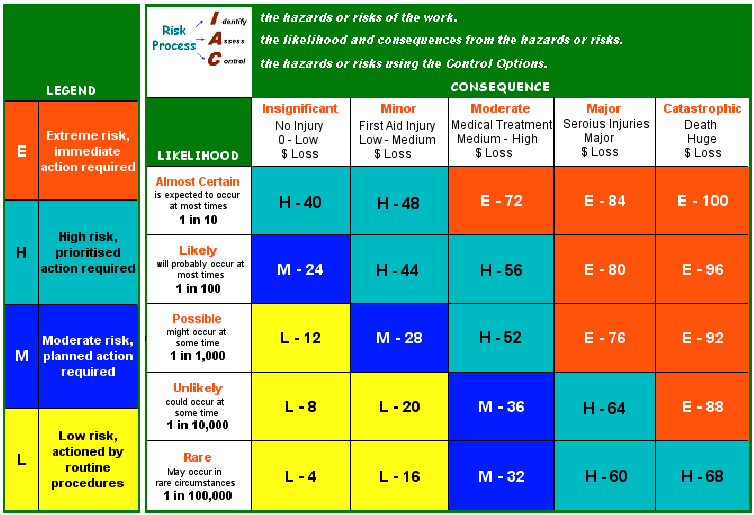 Council recognises 4 levels of risk, low, medium, high and extreme. These risk associated with a given hazard is calculated in accordance with Councils Risk Management Policy using the following risk matrix. Council is in the process of implementing the Assetic Asset Management System. It is expected that Assetic will be used to schedule maintenance & generate asset renewal programs. The following standards & guidelines are used to make decisions about asset management related matters. A number of pipe diameters appear to have been altered when the databases of the four former Councils were amalgamated. All pipe diameters are being checked against the databases they were extracted from and will be corrected, and a revaluation applied to drainage table prior to new drainage assets being inserted into the database in the 2009-1010 financial year. The majority of the figures used in this plan were generated from Council's Assetic Asset Management System. The asset database was compiled from numerous databases and spreadsheets used by the former Councils of Bundaberg, Burnett, Isis & Kolan. The quality of the data available varied from Council to Council and asset class to asset class, and has been further degraded as a result of the compilation process used by the consultants responsible for the implementation of the system. As a result the figures used in this plan whilst indicative of the scope and condition of the drainage network, but should not be presumed to be 100% accurate at this point in time.